They say laughter is the best medicine. There is no place where you can get more of that than at an excellent comedy venue. In Indiana, you’ll find top-notch improve comedy groups, hilarious local comics, and more, at the state’s cool comedy spots. Here are the 10 best places to see live comedy in the state. Fun for the whole family, ComedySportz Club in Indianapolis, Indiana, has been bringing the laughs to people of all ages since 1984. All the acts at CSz consist of what is known as “short form improv” comedy, based on audience suggestions (think “Whose Line Is It Anyway?”). Audience members are invited and encouraged to participate throughout the entire scene, game, song, etc. In order to keep it family friendly, CSz has a “Brown Bag Foul” rule to keep the “foul mouthed” participants at bay. In addition to being live, interactive, hilarious and versatile, CSz also offers group training seminars and summer camps for middle and high school students interested in improvisation comedy. IndyProv isn’t your typical comedy club. They’ve been Emmy-nominated for their hard work in improve comedy, and are a traveling troupe. They teach classes in improvisational comedy, as well as standup comedy classes. Comedy camps are also offered, from children in fifth through eighth grade, as well as adults. IndyProv is also responsible for bringing some of the biggest names in Drag to Indianapolis and Bloomington. Do the names Bianca Del Rio, Adore Delano, Alaska or RuPaul sound familiar? That’s right! Many of the lovely ladies from RuPaul’s Drag Race can be found here at IndyProv! Not only do they do comedy, they also offer corporate trainings and private shoes to organizations and businesses to teach them creative thinking and effective communication skills. Don’t let the tire fool you. The goal of the Road Rubber Comedy Club is bringing comedy to the forgotten “rural” markets of the Midwest. One of the best places in Indiana to find comedy that will leave you laughing for days, Road Rubber is where you want to be. With comedians such as Kevin Farley, Donnie Baker, and Mike Marino, Road Rubber brings the house down every year. Though the atmosphere is laid-back and relaxed, the comedians definitely are not! You are sure to have a good time here! The Comedy Attic is the place is to be in Bloomington for comedy this year. From big names like Sara Schaefer, Mike Birbiglia, Rachel Feinstein and Shane Torres, it’s bound to be endless nights of nights at the Comedy Attic. You walk in and immediately feel as though you’ve entered a New York comedy club with its laid-back atmosphere. The staff are as friendly as can be and aren’t shy about sharing in the laughter. Don’t forget about the open mic night every Wednesday, in which you can test out your comedy skills. Get ready to have your mind blow at this unique club in the heart of downtown Indianapolis. The Mind Tripping Show incorporates mind reading, influence, psychological illusions, and comedy to create a night of fun and entertainment for all! It’s one of Indianapolis’s longest running live shows. Christian and Katalina are a husband and wife comedy mind reading duo, and absolute gems in their performances. No one knows just quite how they do it, but you’ll be left exhilarated and exhausted from laughing, and scratching your head at the same time as you try to figure out their illusions! Come to the Drop Comedy Club and be prepared to laugh until you cry! A comedy club for comedians by comedians, the Drop Comedy Club has some of the best comedians in its lineup. From Kyle Kinane to Todd Barry and more, many comedians that take the stage at the Drop have appeared on networks such as HBO, NBC, FOX, etc. The Drop is somewhere to go on a first date, hang out with friends, or just enjoy a good laugh and a good drink. Not to mention, you can get in free during your birthday week! That’s right. Within seven days of your birthday, you can get in free to any show of your choice! Morty’s Comedy Joint off East 82nd Street is the place to be this summer for hilarious comedy that will leave you breathless. They pride themselves on finding the best of the best to perform and bring the house down every time. The owners are warm and welcoming, as are the staff and want you to have the best experience possible in live comedy. Morty’s offers a variety of discounts, such as ladies night on Thursdays, and on Friday nights, law enforcement officers, military officers (active or retired), and college students can come join for free or a discounted rate! You won’t be disappointed! Head on down to Crackers Comedy Club and help them celebrate over 35 years of comedy! Since 1980, Crackers has been the place to go for live, side splitting comedy. 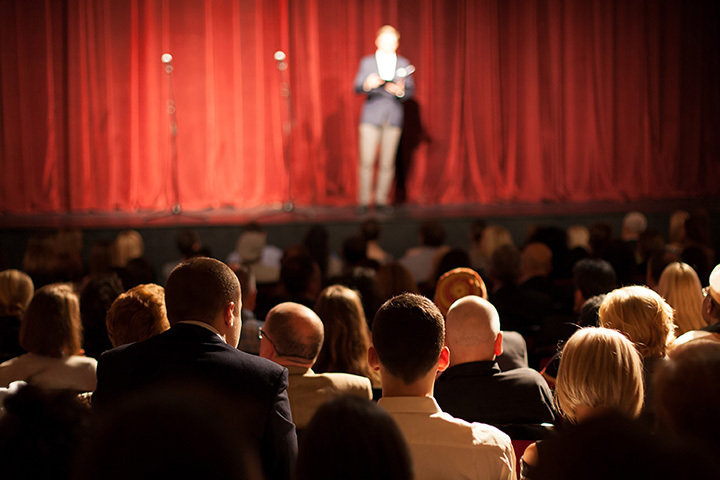 Throughout the years, they’ve had big names grace the stage: Ellen DeGeneres, Jay Leno, Dennis Miller, Chris Rock, Tommy Chong, Christopher Titus, and so many more! Crackers holds fundraisers every year for various organizations, charities, school sports teams, etc. to help in the community. View more Indiana Comedy Clubs.